Have you just gone gluten free and are looking for some freedom to occasionally enjoy some baked goods, but have no idea where to start? Don’t worry, let us walk you through some of the basics so you can begin to create your own gluten free baked goods with more confidence. Below we’ve listed some handy gluten free baking tips and tricks, so you know what to when replacing wheat flour in a recipe. When switching from traditional all-purpose wheat flour to a gluten free flour alternative, expect to go through a trial and error period! Remember, these flours act very differently than traditional all-purpose flour. Gluten free flours benefit from being blended with a mixture of other gluten-free flours. This improves the texture, mouthfeel and flavour of your baked good. It can often work out cheaper too. Remember just because you’re gluten-free doesn’t mean that you have to miss out on delicious baked goods. If you focus on foods that are naturally gluten free you begin to realise that there is so much to choose from. 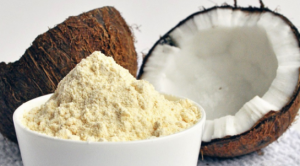 Coconut flour is a popular alternative and can be purchased in many supermarkets now. We recommend using approximately ¼ – ⅓ cup coconut flour for 1 cup grain based flour as well as increasing the number of eggs you use. Generally for every 1 cup of coconut flour you will need 6 -7 eggs and 1 cup of liquid. Another tip is to always sift coconut flour and then measure it (don’t pack it down), otherwise your baked goods can end up too dry and dense. If you have never used coconut flour before, follow a recipe exactly, as if you add too much or too little it can result in a really dry and dense baked food. Buckwheat is one of the best substitutes for wheat flour and can be swapped 1: 1. It is best used in recipes which don’t need to rise such as; cookies, fritters, pancakes, slices and brownies. 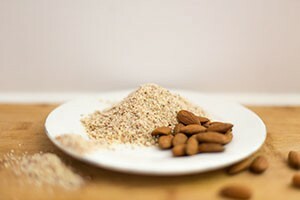 Almonds don’t contain starch or gluten, it often needs extra binding ingredients to give it more stability and volume. Ingredients such as eggs, tapioca or arrowroot, vinegar and baking soda are perfect for this. 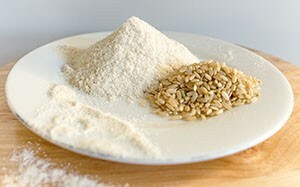 Almond meal works well in brownies, cupcakes and cakes, however if your recipe requires gluten for stretch, mouth feel and stability then you may need to experiment with mixing in some quinoa, rice and/or buckwheat flour, in addition to another binding ingredient as mentioned previously to achieve the best end result. 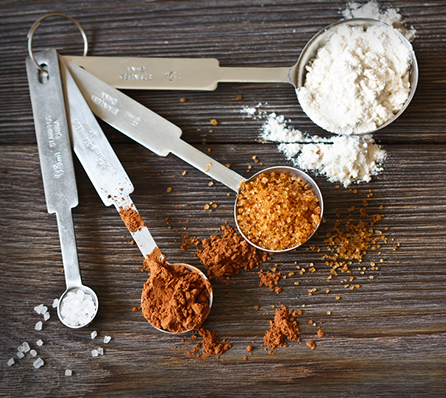 Once you’ve opened the packet, store your almond flour in the refrigerator or freezer. This will prevent spoilage and extend the shelf life of it too. Alternatively you could blitz some almonds in your food processor, thermomix or nutribullet to make fresh almond meal for your recipe. This flour can also be used the same way as almond flour, but yields a slightly different flavour to the baked good. Once you’ve opened the packet, we recommend to store it in the refrigerator or freezer, this will prevent spoilage and extend the shelf life of it too. For those allergic to nuts, sunflower seed flour/meal can be used the same way as almond flour/ meal. Sometimes it can be a little denser so you might need to use a less amount. 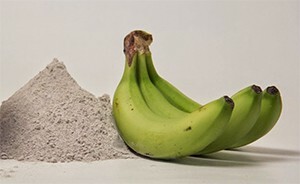 Use approximately ⅔ cup of banana flour for every 1 cup of wheat flour. It actually mimics wheat flour surprisingly well. It can be used by itself, but also works well with other gluten free flour alternatives too. This has the ability to bind (similar to tapioca starch, but with more of a wheat flour like texture and crumb). You can generally substitute it with wheat flour 1:1. It seems to work very well in soft, cakey and/or chewy baking recipes and not as well if you want some crunch or crispness (like on the crust of bread). Its starchiness makes it excellent gluten free flour but is not recommended for use with high acid foods because it loses its ability to thicken when mixed with acidity. Handy tip: if you’re using tapioca to thicken sauces, stews, gravy, custard etc, it’s best to dissolve it in a little cold water first, otherwise it can solidify and be pretty tricky to work with. It also works well in milk-based recipes, so it should be used instead of arrowroot for gravies or other dairy-based recipes. Tapioca works well in paleo bread and cake recipes as it gives a little more bounce to the baking. You can replace up to about ½ of the flour in a recipe with tapioca. Tapioca can withstand being heated for a long period of time, which is an important difference from arrowroot. Some people think arrowroot and tapioca are the same thing. It is very similar to tapioca and can also be used as a thickening agent but they are different. Arrowroot is best used in acidic dishes/ sauces and is great for thickening such foods as sauces, fruit desserts, glazes and baked goods. If replacing wheat flour with arrowroot flour to add lightness to a recipe, replacing up to ¼ of your flour with arrowroot is typical. Arrowroot flour can also replace corn starch in recipes 1:1. Handy tip: Don’t overheat it, because it can lose its thickening properties, so it’s best to add it in at the end of cooking. Cassava flour can be swapped with wheat flour on a 1:1 ratio in many recipes. Many people think it is the same as tapioca flour as it comes from the same root. However as it comes from the whole root, it has more dietary fibre in comparison to tapioca, resulting in it being more versatile. It has a mild and neutral flavour; and isn’t grainy or gritty in texture. Rice flour is made from finely milled rice, and comes in both white and brown varieties which can be used interchangeably. It is a great substitute for wheat flour from a textural perspective. You can replace up to ¼ of wheat flour with rice flour. Since rice flour absorbs more liquid than wheat flours, you may need to add more eggs and/or liquids. Rice flour is great mixed with other gluten free flours too. This has a slightly earthy, nutty taste and can be used in cookie recipes. However, it may produce a drier batter. You can add some extra water, oil, or apple sauce to counteract this effect which will return your batter to the desired consistency. 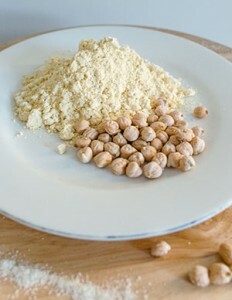 Chickpea flour is a great source of protein, fibre, and iron. It does have a noticeable chickpea flavour so personally I think it’s best used in baked goods that have strong flavours, such as fudge brownies, pumpkin pancakes, zucchini and cheese fritters. Please note that bean/legume flours can cause gas, cramping and other digestive issues. Remember that gluten free baked goods may never taste like the food you are used to eating. However over time it will be something which you will begin to love the taste of. When you make things using real food ingredients it will truly start to nourish your body and you will reap the benefits. The most important thing is to PLAY and EXPERIMENT with different flours and combinations to see which one works best for you. Begin to find your own combinations. Sometimes you may need to use your intuition when working with gluten-free flours as the batter may not be thick enough or the texture may be different to what you’re used to. However, stick with it, and keep trying new quantities and different flours. You’ll be amazed at your own creations. Plantains are a member of the banana family and they usually resemble green bananas. They are a starchy, low in sugar variety that is cooked before serving as it is unsuitable raw. It is used in many savoury dishes somewhat like a potato would be used and is very popular in Western Africa and the Caribbean countries. It is usually fried or baked. Plantains are longer than bananas and they have thicker skins. They also have natural brown spots and rough areas. Bananas are shorter, sweet, can be eaten raw when ripe and have a thinner skin. This is good information, however some of these are difficult to source, particularly in regional areas of Australia. Are you able to suggest good Australian sources for banana, plantain and cassava? Hi Karen, luckily you can source these types of products online. You could try companies such as iHerb, Natural Evolution, Honest to Goodness and more. Thank you for the whole info.